Inky Fairy Designs: SugarPea Designs JULY Guest Designer - Pucker Up! Hi everyone! I’m so excited to be sharing another post with you this month as a Guest Designer for SugarPea Designs. I absolutely adore the Pucker Up stamp set from the June Release. With all the fun little images, I was thrilled to have the matching SugarCut Dies to work with as well and created an easy set of notecards with my favorite technique for creating backgrounds with Distress Oxide inks. 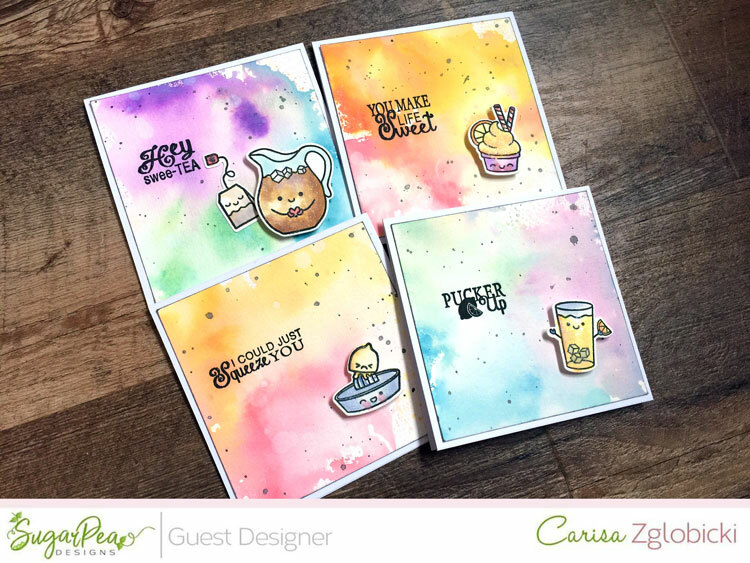 To see more pictures of these cards and how I created them, please hop on over to the SugarPea Designs Blog right now and leave me some love over there so I know you visited! ;) I also created a start to finish process video for this so you can see them all come together. You can check it out here on my blog below or head over to my YouTube Channel and subscribe so you don't miss any future videos as well.